Spring brings layers of color to Istanbul, spread across the city's gardens as trees and flowers come alive. The new season is an enchanting time to visit the city's historic gardens, where the perfect photo opportunities are available at every turn. Ranging from the Fener Garden owned by the royal family of the Byzantine Empire as a summer house to monastery gardens famous for healing plants and the Yıldız Grove where Pan, known as the god of nature and the shepherd in mythology, is said to have wandered while playing his flute, Istanbul's gardens have always been a subject of interest throughout history. Even though there is a limited amount of information available about the gardens of the ancient Byzantine palace, the most important garden in Istanbul after Sarayburnu is the Fener Garden, which has remained as one of the most appealing gardens of the Ottoman period. During the Byzantine period, plants such as onions, turnips, carrots, beets and spinach, were grown in home gardens to meet people's needs. As mentioned in the book "Istanbul'un 100 Bahçesi" (100 Gardens of Istanbul) published by Kültür A.Ş., during the Byzantine era the gardens were usually set up in the vicinity of the palace. Due to transportation problems, the Bosporus ridges were empty except for a few monasteries. The monastery gardens, usually arranged in the shape of a crucifix, were used by the Byzantines for the purposes of reading and relaxation. According to the book, the Ottoman gardens were, "Unlike the Chinese and English gardens, evoking an understanding and acceptance of the boundary between nature and humanity, which did not seek to reprocess nature. Instead of dividing and shaping the gardens with sets, staircases, ramps and roads, the Ottomans preferred to perceive the gardens holistically with their trees, flowers and animals, and to see the people as a part of it." 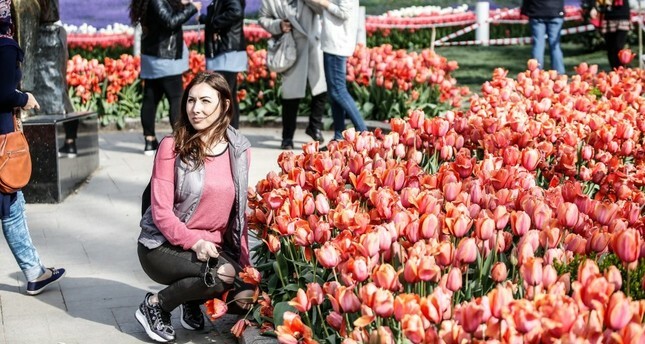 The gardens of Istanbul lived their Golden Age during the Tulip Era. An intensive forestation activity in Istanbul was carried out during this period and the hills and slopes of the city were planted with seeds brought from İzmit, Kocaeli and Yalova. The Ottomans chose to create gardens that fit the topography and climate - basically the conditions of the land. Rather than opening water channels, the Ottomans made their gardens next to rivers. Not only gardens but also fields came into blossom under the rule of Sultan Süleyman the Magnificent. A cultural love for flowers blossomed daily and ensued for centuries, resulting in the emergence of the unique flower gardens of the Ottoman Empire. In modern-day Emirgan Grove, the Feridun Pasha Garden was one of the most significant botanical areas in Istanbul. Given to the late Feridun Pasha by Fatih Sultan Mehmed as a gift, this former summer house was the location of a historic garden within which Croatian masters built a summer hunting lodge and hunting pavilion. There are more than 120 species of trees and bushes in Emirgan Park, which sits across an area of over 300,000 square meters. In addition to common tree species such as pine, weeping willow, linden, cherry, quince, peach and walnut, rare trees such as the Japanese cherry blossom tree can also be seen. Spread across the slopes between Beşiktaş and Ortaköy, Yıldız Park is the largest park in Istanbul. Sultan Abdülaziz later connected this grove to the Çırağan Palace with a bridge adorned with stone and marble, part of which is still standing on the main street today. When Sultan Abdülhamid II moved in the palace after ascending the throne, he ordered the addition of new mansions and buildings to the garden. Known as the former Crucifix Garden which was named after a crucifix built by Constantine the Great, this garden was renamed Beylerbeyi after the construction of the Beylerbeyi Palace in the Anatolian side under the reign of Sultan Mustafa III. While garden was intended to be enlarged, property belonging to a widow next to the garden blocked these ambitions and the garden was sold to the public. Mahmud II had the buildings in the garden restored by repurchasing the sold areas of the palace and built a waterfront palace. The Beylerbeyi Palace Garden, which resembles European gardens due to the influence of foreign gardeners employed by the empire, is still a well-preserved and beautiful garden today.